The Community Platform joined with the Economic, Social and Cultural Rights Alliance to mark the 70th Anniversary of the signing of the UN Universal Declaration of Human Rights. 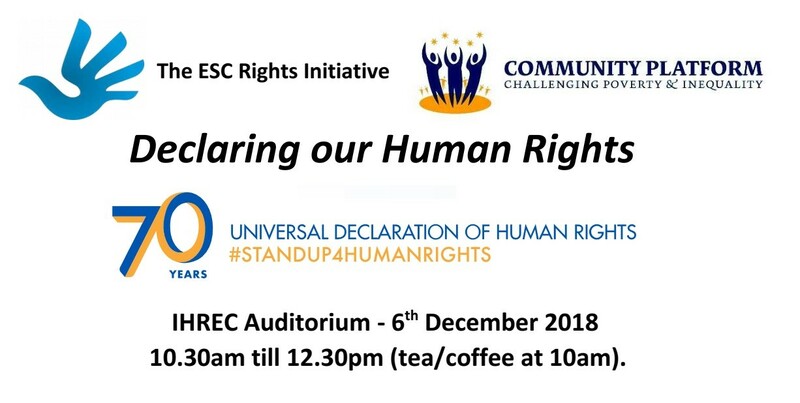 The ‘Declaring our Human Rights’ event involved group and personal reflections of the meaning of the Declaration for people’s lives, song and creative expression. Everyone was reminded of the importance of continuing to demand that everyone’s human rights be respected and realised. The Platform and ESC Rights Initiative issued the this press release on the day. 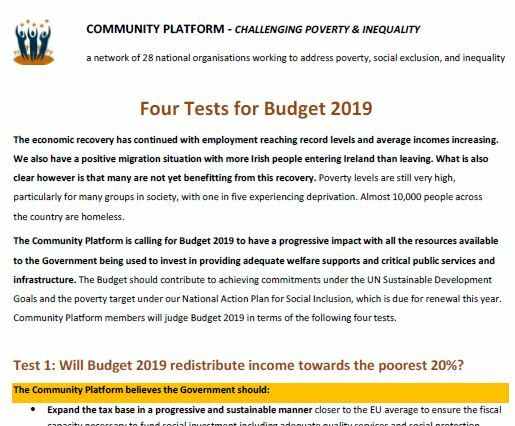 On the eve of Budget 2019, a network of 28 national organisations in the community and voluntary sector is reminding the Government that the Budget must move Ireland towards achieving its national and international commitments to ending poverty, reducing inequality and creating a more sustainable future for everyone. These commitments are made under the UN Sustainable Development Goals, the European Pillar of Social Rights and a range of national strategies including the National Action Plan for Social Inclusion. The aim of the workshop is to build the knowledge of community and voluntary organisations of the main governance requirenments they need to comply with under a range of different legislation.